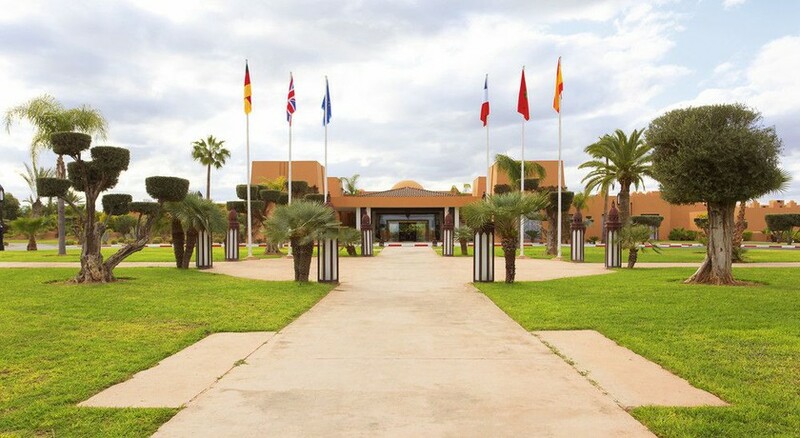 Cocooned in lush greenery, the ClubHotel Riu Tikida Palmeraie is a peaceful oasis for sunseekers, within easy reach of Marrakech. This luxurious hotel resembles a little village sprinkled around 13 acres of gardens, there is a trio of restaurants, loads of activities, and a huge swimming pool with a wraparound sun terrace to enjoy. All the rooms at the ClubHotel Riu Tikida Palmeraie are spacious and comfy with a mix of modern décor and authentic Moroccan touches such as pretty inlaid wooden tables. You will have every modern comfort on hand too, rooms are well-furnished with satellite TV, a balcony or terrace and the pool areas boast pool bars, cabanas and al fresco dining areas. Further facilities for kids include the specially designed RiuLand kids' club and a playground. The hotel has an indoor swimming pool with climate control feature, as well as a Wellness Centre that offers spa and hammam treatments, massages, a beauty salon and hairdresser. ClubHotel Riu Tikida Palmeraie, built in 2009, is an ideal destination for couples or families wanting a luxurious and tranquil break near the bustling, cosmopolitan centre of Marrakech. Its close proximity to many tourist attraction, all within easy reach makes it a popular choice among tourists. For culture, explore the city’s old quarter (6km), or indulge in the fascinating shopping experience that is Marrakech's Grand Souk where you can haggle over beautiful home furnishings and souvenirs, just a 15-minute taxi ride from the hotel. 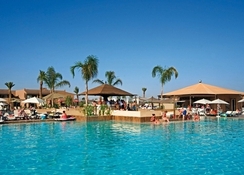 The nearest airport of Marrakech is just 25 minutes away from the hotel. There are 350 rooms here, spread over five low-level buildings. Expect a gorgeous view from your room balcony or terrace. If you’re staying with family, then opt for twin rooms with an interconnecting room. But, if you’re seeking more space, then opt for a junior suite, which also comes with a lounge area. 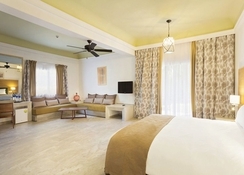 Rooms come fully equipped with climate control air conditioning, a safe and mini fridge. ClubHotel Riu Tikida Palmeraie comes with an all-inclusive package, allowing you to just relax and enjoy the whole experience. Breakfast is an American-style buffet and lunch and dinner offer the best in authentic Moroccan cuisine. Other themed nights in the pool side restaurant include Italian cuisine night. 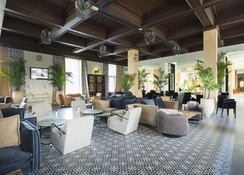 Additionally, the hotel has three bars offering a wide menu of delicious cocktails and mocktails, light refreshments and snacks. The entertainment options at the ClubHotel Riu Tikida Palmeraie are countless, all thanks to the year round calendar of activities at the hotel. Check out the RiuArt workshop, where you can unleash your artistic side. Sports lovers will enjoy RiuFit, a special program of sports activities within the hotel, including gym workouts, swimming and other sports. Keep little ones happy with a plethora of activities designed for them at RiuLand kids' club, including a kids’ pool and a playground. The hotel's extensive facilities also include Tikida Spa, an authentic hammam, and an indoor pool.